Car site Edmunds.com is releasing stats today that show how the proliferation of mobile devices has ultimately flipped the car-buying experience from desktops to smartphones. In the past year, traffic from smartphones and tablets has doubled for the Santa Monica, Calif.-based Web company, and those folks may be closer to actually buying a car than some may think. And to keep up, auto brands are employing data and better targeting to reach folks in the market for a new car. Here are four of the most intriguing differences between Edmund's mobile and desktop users. 1. Smartphone users are 2.5 times more likely to click on mobile ads than on desktop promos on Edmunds.com. To make sure those clicks were intentional (and not a "fat finger" user error), the site tracked the clicks and found that people went on to research cars on brands' and dealers' sites after tapping on an ad. Why the high click-through rate? Edmunds didn't say, but a quick look at its mobile site shows an interesting carousel ad format at the top of the page that scrolls through sponsored photos of cars—akin to native content. 2. Seventy-nine percent of people who access Edmunds.com from a smartphone zero in on a specific car model, meaning that mobile users are doing in-depth research from smaller screens. To compare, 65 percent of desktop users look for information on car models. 3. Fifty-five percent of Edmunds' smartphone users are millennials versus 26 percent of desktop users. 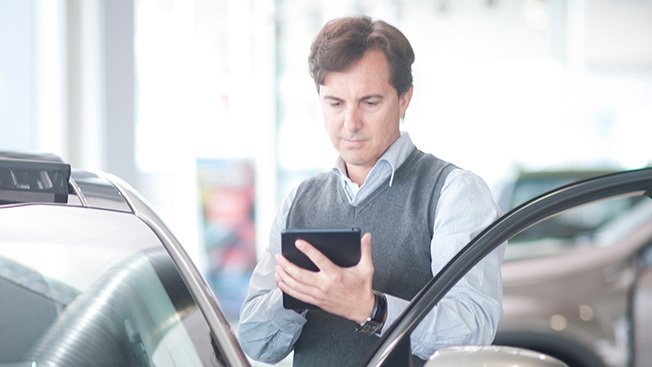 And unsurprisingly, with smaller incomes, mobile millennials are more likely to check out used car information: 53 percent of smartphone shoppers pulled up data about used cars as opposed to 38 percent of desktop users.